Salmonella bacteria are tiny terrorists that infect cells and ultimately destroy them. They can't, however, just kill cells outright. The attack must be far more measured, so that the bacteria will have time to multiply before the cell dies. To control this process, Salmonella bacteria inject a deadly cocktail of proteins into their targets. These "effector" proteins assist in the entry of bacteria into the cells, they thwart cellular defense systems, and they ultimately destroy the cells when the bacteria have finished with them. Many of these effector proteins are injected into cells through a "needle complex" in a process called type III secretion. Structures are available for a few of the many components of this complex, as shown here. In the image, we are looking from the outside of the cell through the middle of the complex. At the center, there is a "needle" protein with a narrow opening, shown in red from PDB entry 2v6l. Because the opening is so small, effector proteins must be unfolded before they are threaded through the hole and into the infected cell. 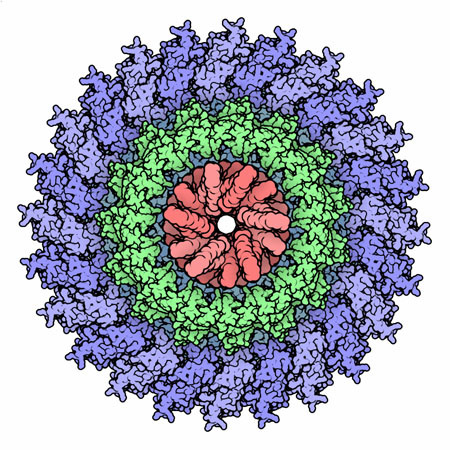 Surrounding the needle several concentric rings of proteins, shown here in blue and green from PDB entries 2y9j and 2y9k, that anchor the needle in the bacterial cell wall. As you can imagine, this process must be carefully regulated, so that the proper effector proteins are injected at the proper time. Researchers at PCSEP are using systems analysis to uncover the many players involved in this control. By looking at the proteins that are expressed during infection, and comparing these to the bacterial proteins that are expressed at other times, they can identify the proteins specifically involved in secretion, and determine networks of how they interact with one another. By analyzing these networks, they have discovered that many mechanisms come into play, including type III secretion through the needle complex as well as other forms of secretion. Since Salmonella lives and reproduces inside the cells it infects, it needs to control the life and death of the cell. In some cases, such as macrophages, it wants to kill the cell quickly and efficiently, to hobble the immune system. In other cases, such as epithelial cells, it needs to wait and kill the cell later, when it's ready to escape and spread. The bacterial effector proteins make these decisions, forcing infected cells to die on command. 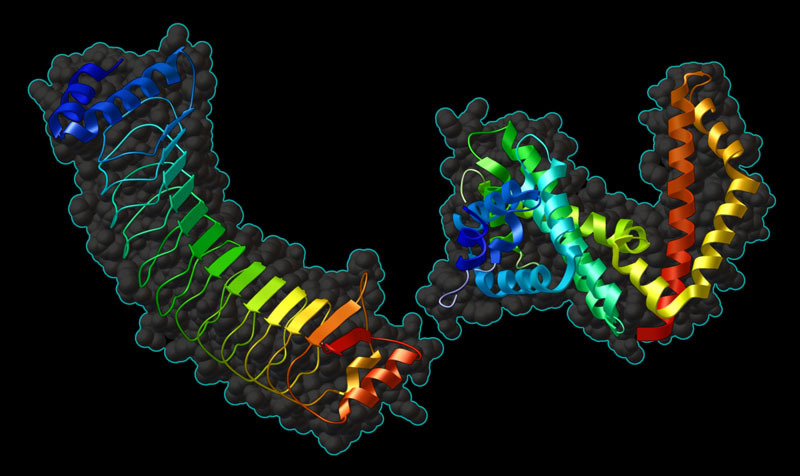 For instance, the SlrP protein of Salmonella mimics the E3 ubiquitin ligases. These ligases normally control the disposal of obsolete proteins in our cells by attaching the small protein ubiquitin to them, which marks them for destruction by the proteasome. SlrP hijacks this system, using it instead to destroy essential proteins involved in the cellular immune response. MCSG researchers are exploring the structures of these bacterial E3 ubiquitin ligases, looking at the SlrP protein of Salmonella and the similar protein IpaH from Shigella. This is a bit tricky because they are flexible proteins, with two separate domains connected by a short hinge, so PSI researchers had to cut the enzymes into two pieces and solve the structures of each half individually. One half, shown here on the left, recognizes the target protein, and the other half, shown on the right from PDB entry 3ckd, performs the reaction that connects ubiquitin. Structures of the two domains of bacterial E3 ubiquitin ligases are included in this Jmol: the protein-targetting domain of Salmonella SlrP, and the catalytic domain of Shigella IpaH. Use the buttons to look at the two structures and to change the representation. 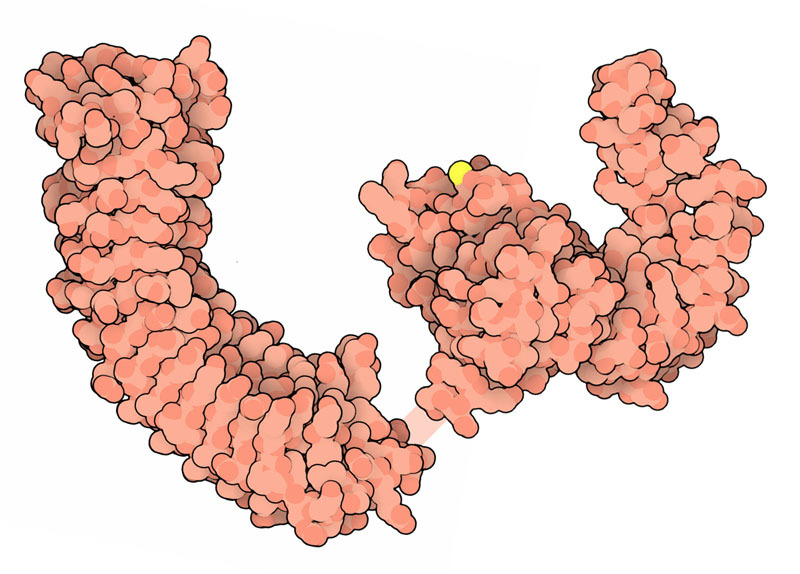 A key cysteine amino acid is thought to be essential for the ubiquitin-transfer reaction--it is shown in bright yellow spheres in the catalytic domain structure. Yoon, H. et al. Systems analysis of multiple regulator perturbations allows discovery of virulence factors in Salmonella. BMC Sys. Biol. 5:100 (2011). McDermott, J. E. et al. Computational prediction of type III and IV secreted effectors in gram-negative bacteria. Infection and Immunity 79, 23-32 (2011). Schraidt, O. & Marlovits, T. C. Three-dimensional model of Salmonella's needle complex at subnanometer resolution. Science 331, 1192-1195 (2011). Bernal-Bayard, J. & Ramos-Morales, F. Salmonella type III secretion effector SlrP is an E3 ubiquitin ligase for mammalian thioredoxin. J. Biol. Chem. 284, 27587-27595 (2009). Singer, A. U. et al. Structure of the Shigella T3SS effector IpaH defines a new class of E3 ubiquitin ligases. Nature Struct. Mol. Biol. 15, 1293-1301 (2008).